Metro: Last Light game is coming to Linux? If you like post-apocalyptic shooters and use Linux, we have great news for you. Famous Metro: Last Light game from 4A Games soon may be released for this operating system. At least today it has appeared in the Steam's database that is a very good sign. The representative of the game's publisher recently has mentioned in AMA subreddit that now is a good time for porting current and future projects to Linux. But we didn't think that this process will start so quickly. 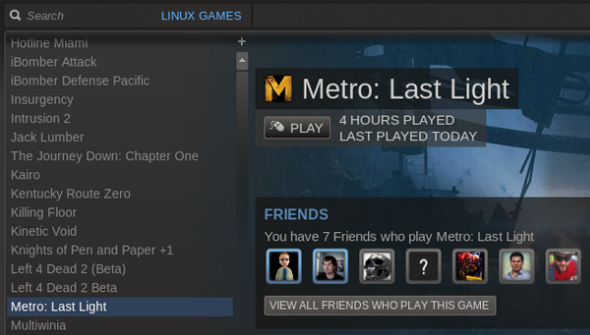 Today in Steam's database several new lines about Metro: Last Light game have appeared, and the project has been listed among the Linux games. However now you can't download the alpha or even the beta version of the game, but we hope that soon you will be able to do this. Also earlier the developers mentioned that they are planning to release Metro: Last Light game for the next generation of consoles. For those who have forgotten we would like to remind that Metro: Last Light game is a first-person shooter with survival horror elements and a sequel to Metro 2033. The full-fledged information about this project is in our Metro: Last Light review.